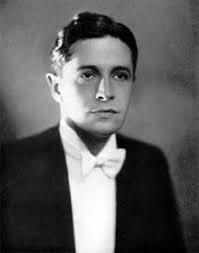 Welsh composer and actor Ivor Novello was one of the most popular British entertainers of the first half of the 20th century. Born into a musical family, he eventually moved to London and took up residence above The Strand Theatre where he lived until his untimely death in 1951 at the age of just 58. Rejecting much of his initial classical training in choral and oratorio work, he made his name writing musical comedies, cheering both soldier and civilian alike in the First World War. His first major hit “Keep the Home Fires Burning” became the country’s unofficial national anthem during those dark days of grief and uncertainty. 2013 marks the 120th anniversary of his birth and this show is the brainchild of musical director Ross Leadbeater. He joined forces with Russell Grant, another Weshman with a long-standing love of Novello’s music, to pay tribute to this remarkable composer whose songs are in danger of being forgotten. This piece, back at St James Studio by popular demand, presents some of the great legacy we would lose. On entering the Studio, we are presented with a simple but very effective set (Gregor Donnelly)preparing us to be transported to Edwardian England with tall maroon drapes as backdrop, with a paler colour between and an aspidistra next to the grand piano. The show opens with a projection of Pathé film of Novello’s funeral, immediately reminding us just how popular this man was. Russell Grant hosts the evening reading narration of Ivor Novello’s life and works and occasionally performs with the four singers soprano Katy Treharne, mezzo soprano Annatt Bass, baritone Rhidian Marc and tenor Martin Milnes. Each of these singers is well cast with vocal range and qualities suited to the material. Well directed, no-one falls into the trap of using ‘twang’ quality on top notes, ubiquitously used in modern musicals, and each embodies appropriate character traits of the period from the ultra feminine to romantic hero to callow youth. As well as solos, there were duets such as the amusing “Why Isn’t it You?” between the awkward young man played as the gay Ivor Novello himself by Martin Milnes and the predatory Annatt Bass, and the group numbers are particularly well staged by movement director Philip Joel, who manages to make the small platform of St James Studio look and feel like a larger proscenium arch, whilst losing none of the intimacy of the space. The second half places Novello’s work in the context of other British musical comedy composers from the earlier influence of Gilbert and Sullivan through Noel Coward and Vivien Ellis to Stiles and Drewe and Andrew Lloyd Webber. Special guest Robert Meadmore makes an appearance presenting a selection of the early work, and Webber’s duet “All I Ask of you” with Katy Treharne , having both appeared in “Phantom of the Opera” at different times. Standout numbers from this half include an excellent rendition of “What Kind of Fool Am I?” from Martin Milnes capturing Anthony Newley’s essence without apeing him, and Brunger and Cleary’s funny “A Simple Valley Song” sung by Katy Treharne, with hints of other qualities to her voice. It would be good to see further develpment to this idea, perhaps following Rhidian Marc’s well sung solo from Novello’s early musical “Glamorous Night” with more of Novello’s post war work set against a greater selection from his friendly rival and great admirer Noel Coward. Novello wished to portray beauty both in music and on stage and screen. His work was highly influenced by operetta with a strong individual style of his own, but as the years of post war Britain, particularly the 2nd World War, brought irreversible social change and morés, his work became increasingly seen as old-fashioned and out of touch with modern tastes and preoccupations. Grittier angrier plays were to appear on West End stages for the years to come and, although Coward’s work has often been revived, acknowledgment of Novello is relatively rare. Perhaps with the upcoming centenary of World War I, this might hopefully be addressed. This entry was posted in Cabaret Reviews and tagged Annatt Bass, cabaret, cabaret reviews London, fiona jane weston, Glamorous Night, Ivor Novello, Katy Treharne, Keep the Home Fires Burning, London theatre, Martin Milnes, Philip Joel, Rhidian Marc, Robert Meadmore, Ross Leadbeater, Russell Grant, St james Studio, St james Theatre. Bookmark the permalink. I could not resisit commenting (not something I usually do) on how much I loved your blog. I am a London comedy club and would love to link to it as I think people would love it. Reblogged this on Capital Cabarets And Other Shows Scene. Quick notice on this show – I am pleased to say it is to be staged at The Hippodrome in London on November 16, with the lovely Sophie-Louise Dann in the cast. This is good news on two counts – one, that this piece is still being performed and the work of Ivor Novello being aired, and two, that The Hippodrome is once again staging this style of cabaret. Deserves support.